Mobile devices are changing the way we work, interact, communicate and do business in many different industries. Scientific research is no exception to this trend as our own research here at ScienceDirect has found, with 30 percent of our researchers using tablets and 26 percent using a smartphone to access academic content. Organizations can reap significant benefits by encouraging mobile device use in the workplace – the increased flexibility that allows staff to work where they like and on whatever device they choose significantly increases users' productivity. Our survey found that almost three-quarters of those using ScienceDirect felt it was important to be able to access scholarly information via tablets. However, designing a mobile website to present something as complex as scientific articles, laden with diagrams and tables, is not a particularly easy task – and as ScienceDirect contains articles taken from over 2,500 journals, it was no small task. User expectations of mobile experiences are high, having been shaped by consumer sites that work effortlessly on mobile devices. At the outset, we engaged with librarians and researchers that use ScienceDirect to solicit their feedback. "Friendly, fast and focused" were the three key attributes that our researchers mentioned most often. The overriding philosophy throughout the design process was "mobile first." There are many websites that claim to be mobile-ready, but few are truly optimized for mobile devices and often deliver a disappointing experience. In fact ScienceDirect has been accessible via mobile, but the experience was not optimized. We have now optimized the experience. ScienceDirect is built with responsive design principles for fluid scaling of text, images and tables and to maximize readability on all screen sizes; keeping the need for resizing, panning and scrolling to a minimum. Ease-of-use, the hallmark of positive mobile experiences was also crucial – so we sought to "keep it simple" throughout the entire process. The best designs, after all, are the simplest. The article itself has top priority in the new mobile design of the article. We needed to present the content in a clean, comfortable interface that makes it easy for the user to read an article. We've dedicated 91 percent of the available screen space space to the article; the remaining space is used for essential functions such as the search bar at the top of the screen. The article view is tailored to how people work when they use a mobile device, with simple browse, scan, read and save-for-later features; users can also "pinch to zoom" to view tables, diagrams and article references clearly. Finally, the mobile site is also built with speedy performance to counter the high latency, low bandwidth and limited processing power of mobile devices. 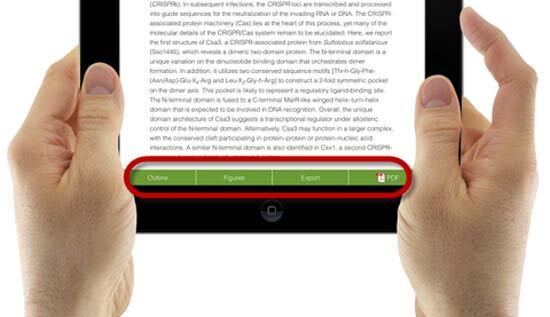 To make it easy for researchers to access and read content on any device – whether in the lab, the classroom, the library or on the move – we built in the ability to export articles in other formats, such as PDFs, and also into external reference managers like Mendeley, RefWorks, EndNote and BibTeX. Through Mendeley, researchers can also better share articles and collaborate with other researchers and colleagues far more easily. Exporting content in other formats and into other applications means ScienceDirect users can take content offline to read wherever and whenever they choose, helping them be more productive and efficient. Overall, it's a very clear, pleasant experience! Articles read like a book on an e-Reader, and the readability is very high with a great font size. It's also very handy that I can get to the full text from the reference list. You see the abstract immediately, there's not too much additional content and you can very quickly see what you're looking for. It's very clear and the response time is very good! The display is very readable, the font size makes for easy reading and the navigation buttons are simple to use." I think it looks really good, showing the articles from the search results in this way certainly brings with it a lot of additional value. At ScienceDirect, we know that our users are increasingly using mobile devices to access our content; with ownership of tablet computers amongst our researchers increasing from 17 percent to 32 percent, and smartphones from 36 percent to 48 percent over the last two years. 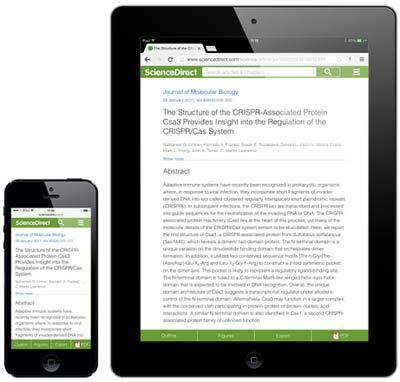 This trend towards accessing scholarly content via mobile devices is set to continue, with 47 percent of ScienceDirect users that don't currently access articles via a mobile device intending to do so over the next two to three years. To make sure we continue to meet the needs of researchers and ScienceDirect users, we welcome your feedback. You can leave comments here or tweet us at @ScienceDirect with the hashtag #SDmobile. Stephan Stipdonk is a Senior User Experience Designer for Elsevier. He is based in Amsterdam. 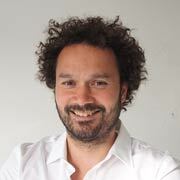 He studied Interaction Design at the University of the Arts Utrecht and philosophy of language at the University of Amsterdam, combining a love for esthetics, usability and logic. At Elsevier, ScienceDirect has been his main occupation, and he is currently focused on making scientific literature accessible via mobile devices with responsive designs.